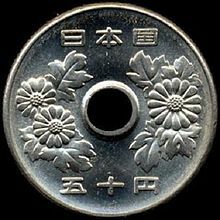 The first 50 yen coin was issued in 1955 and featured a chrysanthemum viewed from the side on the reverse and a stylized ancient weight on the obverse. The coin had a diameter of 25 mm, and was 100% nickel. In 1959, the design was modified, adding a hole in the center due to complaints that the design was confusing with the 100 yen coin, and changing the reverse side to show a chrysanthemum viewed from above. The metallurgy remained unchanged. This design was issued every year from 1959 to 1966. 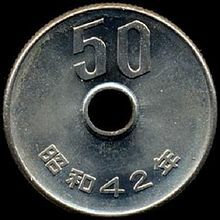 The current design for the 50 Yen coin was first issued in 1967. The metallurgy was changed to a ratio of 75-25 copper-nickel, with the diameter of the coin reduced to 21 mm, and the weight reduced from 5.0 grams to 4.0 grams. The size of the center hole was reduced from 6 mm in diameter to 4 mm. The reverse side retained the use of a chrysanthemum motif, showing three smaller flowers flanking the center hole. The following are circulation dates which cover Emperor Hirohito's reign. The dates below correspond with the 30th to the 64th year (last) of his reign. Fifty yen coins had three different designs, but there was no overlap in mintage between them. Coins for this period will all begin with the Japanese symbol 昭和 (Showa). "Emperors name" → "Number representing year of reign" → "Year" (Ex: 昭和 → 50 → 年). "Emperors name" → "Number representing year of reign" → "Year" (Ex: 平成 → 13 → 年).